Sander Lorier's handmade porcelain platter celebrates a city's topography, serving up major "Wow!" appeal. A balsamic vinegar river meanders around the Statue of Liberty and under the Brooklyn Bridge. Some kind of surrealistic foodie dream? Yes—brought to life by Dutch designer Sander Lorier. Celebrating a city's unique shapes and iconic landmarks, the handmade porcelain platter's topographical features pack major "Wow!" appeal at dinner parties. 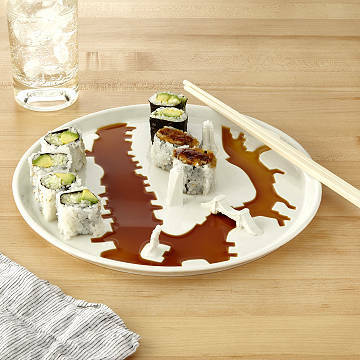 Sushi with a soy sauce river looks spectacular. Chocolate sauce flowing past fruit landscapes is an Oompa Loompa fantasy come true—and conversation will be flowing, too. Show your favorite hostess how much you treasure her invitations. Makes a fun storage tray, too. Choose New York City, San Francisco, or Chicago. Handmade in The Netherlands.